Sisters' House, 50 West Church Street, Bethlehem , Northampton County, Pa.
What a disappointment! Anne Marie Worbass had walked the whole day to join the Moravian settlement at Herrnhaag, in Germany, and when she arrived they had denied her admittance. So she returned to her home in Wittenburg. Later, however, she was permitted to accompany Herr Schlosser, a member of the religious society, to the New World. Again, Anne Marie sought to enter a Moravian settlement. The Moravian elders based many important community decisions upon the casting of lots. After agreeing that a decision needed to be made, they would pose a question, and draw from three lots - yes, no, blank - to determine the will of God. Finally, a few months after her arrival in Pennsylvania, the lots indicated that she could become a full member of the Moravian community. "On November 3," she wrote in her diary, " I moved into the choir house of the Single Sisters ... was happy to have found a little place, for after so much fluttering around my foot could now rest. On July 11, 1752 I was received into the Congregation. I felt touched anew by the dear Savior in my heart and was especially content and happy for some time." Moving into the "Sisters' House" - the Choir for single, young women who were nineteen or older - she quickly adopted a communal lifestyle based upon work and worship. "My worldly business," Anne Marie wrote, "was whatever turned up in the Economy and latterly I was a cook for the Sisters for two years in the Sisters' House." Moravian women worked along with men in the General Economy - a communal economic system in which work and income were pooled - as bakers, dyers, gardeners, herbalists, launderers, midwives, spinners, tailors, and weavers. The Sisters also held important spiritual roles within the community. Single Sisters helped to minister to the younger Sisters who sang in the Little Girls' and Older Girls' Choirs. One Sister, designated the "Helper," looked after the souls of her fellow Choir members. Women also could become Acolytes and Deacons in the Moravian church. 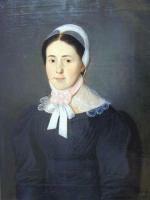 Although the Sisters did not enjoy all the rights of men - women could not become ministers, train as missionaries, or manage the money in the Women's Choirs - they were treated with greater respect and took on more responsibilities in the Church than women in most other Protestant denominations. Moravians, like other Protestants, valued literacy and education so they could read and understand the Bible and other religious works. In Bohemia, Moravian women had hidden copies of the Moravian Kralitz Bible in loaves of bread to hide them from Catholic authorities looking to burn them. In the early 1600s, Moravian leader Comenius had argued that education should be used as a tool to lead the mind and heart towards truth. In 1632, Comenius argued that "not the children of rich or of the powerful only, but of all alike, boys and girls, both noble and ignoble, rich and poor, in all cities and towns, villages and hamlets, should be sent to school." In the New World almost one hundred years after Comenius's writing, Count Zinzendorf's daughter, the Countess Benigna von Zinzendorf, founded a school for the education of girls in Bethlehem. It soon earned such a reputation for excellence that George Washington requested admittance for his niece. Linden Hall Seminary, another Moravian girls' school founded in Moravian town of Lititz four years after Bethlehem's school, is today the oldest girls' school in continuing existence in the United States, and a testament to the emphasis Moravians placed upon equality of education. After the communal system of living ended in the early 1760s, the Sisters' House continued to house unmarried and widowed women. While the outward structure of the community changed, the goals behind the existence of the Choirs-spiritual encouragement and support for mission work- continue to guide Moravian faith. Katherine M. Faull, ed., Moravian Women's Memoirs: Their Related Lives, 1750-1820 (Syracuse, NY: Syracuse University Press), 1997. Beverly Prior Smaby, The Transformation of Moravian Bethlehem (Philadelphia, PA: University of Pennsylvania Press), 1988.